A variable neutral density filter is one of the "must have" filters for your camera bag. Here's why, it's a tool for flexible control of light through exposure time, and allows for creative blur in a composition. 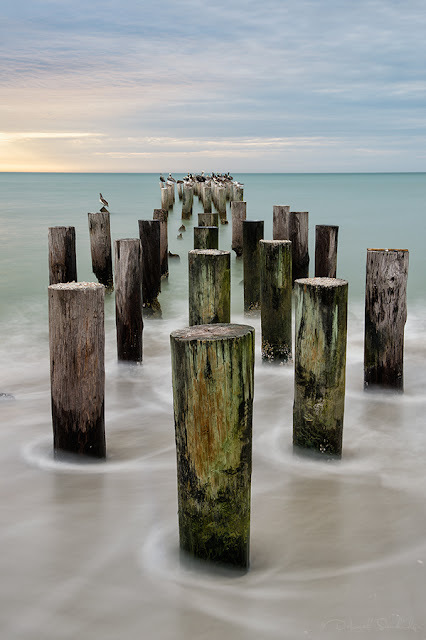 With the photo above, a slow shutter speed allowed me to portray the wave movement as rings around the posts. Rather than freeze the wave action in bright light, the slightly longer exposure time creates an artistic interpretation of the scene. I used a Tiffen variable neutral density filter to photograph the image above. One of the perks of this filter is the thin, yet wide outer ring that reduces vignette issues (darkening of the corners). Variable neutral density filters can be rotated in different degrees to increase length of exposure while maintaining depth of field in various light conditions. It's light enough to keep in your camera bag, and easy to use for a softly blurred effect.